Set on a steep bank overlooking Lake Chukhloma, this monastery has been beautifully restored following years of Soviet-era neglect. This article is from a series by the invaluable William Brumfield, (Wikipedia), Professor of Slavic Studies at Tulane University, New Orleans, USA. Brumfield is the world's leading historian of Russian architecture. He makes frequent trips to Russia, often to her remote regions, and records the most unusual examples of surviving architecture with detailed, professional photography. His most recent book is a real treasure, Architecture At The End Of The Earth, Photographing The Russian North (2015). (Amazon). This truly beautiful book was made possible by the support of a US philanthropist, and its true cost is 3 times its retail price, and we can't recommend it highly enough. Here is our 2015 review of it. Bravo to RBTH for making Brumfield's work possible, and providing such a great platform for his beautiful photography. We recommend visiting the RBTH page, which has a slide show for each article with many more pictures than we can fit in here. Don't believe in miracles? Well, we can assure you, Brumfield's work is undoubtedly just that. You can find a complete list of his articles on RI here. On the way to Soligalich in the northern part of Kostroma Region lies one of Russia’s most picturesque monasteries, located on a steep bluff overlooking the deep blue Lake Chukhloma. The monastery is dedicated both to the Intercession of the Virgin and to its founder, St. Avraamy of Gorodets. Also known as Avraamy of Galich and Avraamy of Chukhloma, this venerable sage led a monastic existence for much of the 14th century until his death in July 1375. 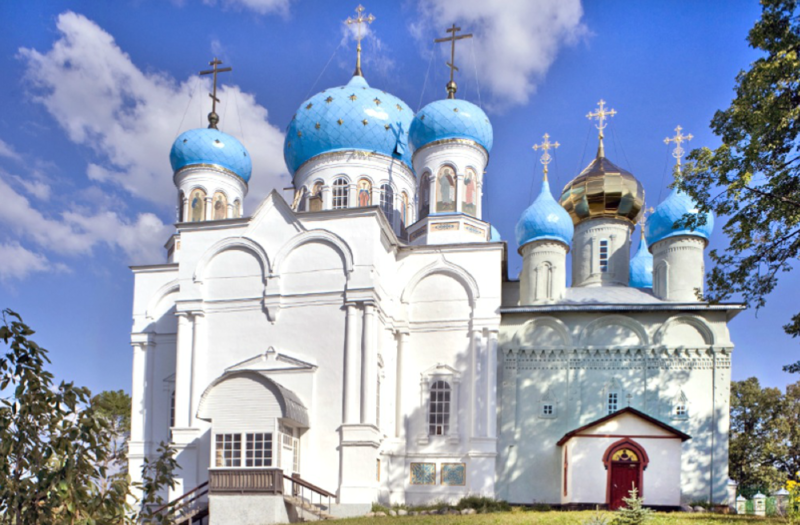 Avraamy was tonsured at the Nizhny Novgorod Cave Monastery, but he soon moved to the renowned Trinity Monastery to the north of Moscow. Like other Russian monastic pioneers in the 14th century, Avraamy was a disciple of St. Sergius of Radonezh (1322?-1392), founder of the Trinity Monastery and the avatar of Muscovite monasticism. At some point in the middle of the century, Sergius gave his blessing to Avraamy’s departure for the Galich principality, far to the northeast of Moscow. In the area of Lake Galich and its nearby town, Avraamy established three monasteries, all of which would be reduced to simple parishes during the monastic reforms of Catherine the Great. Seeking greater isolation, Avraamy moved to the north shore of Lake Chukhloma, where he built a log chapel at the water’s edge. As other monks asked to join him, Avraamy gave his blessing to a community to be established on the bluff above his hermitag and a wooden church dedicated to the Intercession of the Virgin was built there. Sensing his impending death in the summer of 1375, Avraamy moved a short distance from the monastic community and passed away. 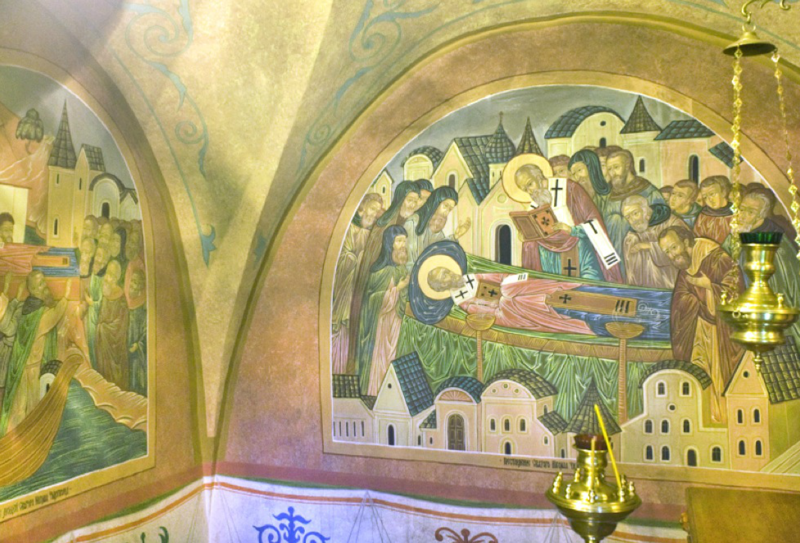 His remains were interred at the Intercession Church. During the 15th century, the monastery received donations from the region’s nobility, and from the princes of Galich and Moscow. Much of its income came from salt refining derived from the area’s many brine pools. Grand Prince Ivan III (the Great) also gave the monastery exclusive fishing rights in the late 15th century. By 1553, Avraamy was locally venerated at what had become known as the Intercession-Avraamy Gorodetsky Monastery. (The Russian Orthodox Church has a system of locally venerated saints in addition to those whose sainthood is venerated throughout the Church.) In 1981, his sainthood was acknowledged by the church as a whole. As was usual in Russia, the Gorodetsky Monastery for the first centuries of its existence was built entirely of wood. The monastery’s original masonry structure, the modest Church (Cathedral) of the Intercession, was begun in 1607 and consecrated in 1632. It is one of the few churches initiated during the brief reign (1606-1610) of Tsar Vasily Shuisky, who had the misfortune to rule during the dynastic crisis known as the Time of Troubles and died in 1612 as a prisoner of Polish King Sigismund III Vasa. 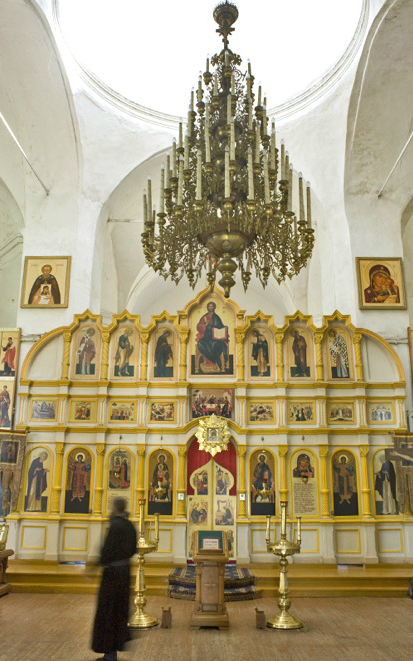 The Intercession Cathedral also contained a chapel dedicated to the Prophet Elijah, as well as the remains of the venerable Avraamy. 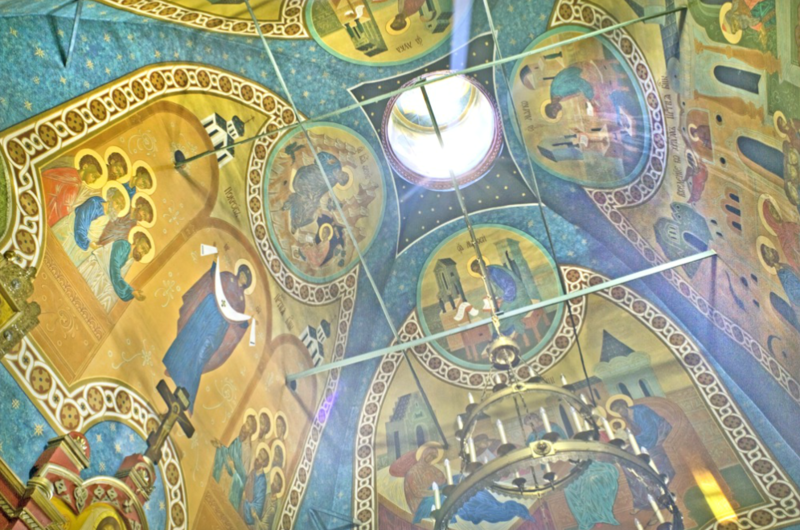 Vandalized during the Soviet period, the church itself survived, and its interior has been sensitively restored both with wall paintings and with a new icon screen. By the mid 17th century, the monastery gained another brick church, dedicated to St. Nicholas and built over the Holy Gates, or main entrance, on the west side of the monastic compound. This church, with an additional altar to St. Paraskeva-Pyatnitsa, has also been restored. 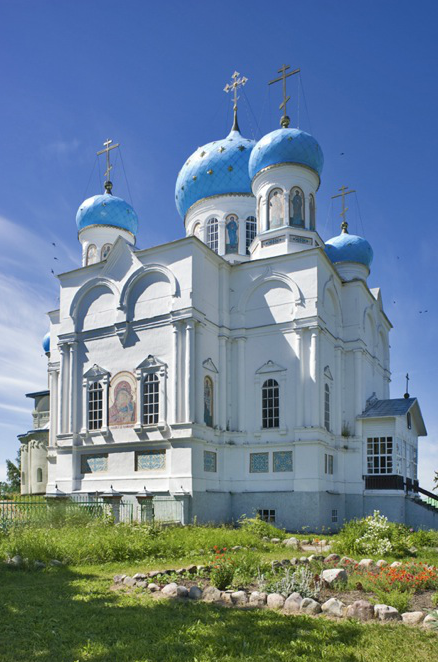 During the reign of Catherine the Great, the Avraamy Gorodetsky Monastery was stripped of its landholdings, but continued to survive on local donations. In the 19th century, it further benefited from the large trading fairs (the Avraamy Fairs) that were held near the monastery several times each year. Indeed, the monastery’s regional prominence and favored location led to a surge of construction in the latter half of the 19th century. The first phase began in 1857 with the dismantling of the Chapel of the Prophet Elijah attached to the north wall of the Intercession Cathedral. In its place, a large cathedral dedicated to the locally revered Tenderness Icon of the Virgin was built during the decade from 1857 to 1867. Fortunately, the 17th-century Intercession Cathedral was preserved, and the two structures were connected by a passage. The design of the new cathedral followed the Russo-Byzantine style developed by the prominent architect Constatine Thon, author of the original Cathedral of Christ the Savior in Moscow. The structure, crowned with four large cupolas, has extensive paintings on its white facade. The interior is well illuminated and has a new icon screen. After the completion of the Tenderness Icon Cathedral, work began in the 1870s on a grand four-tiered bell tower over the North Gate. Together with new cloisters, the 19th-century buildings transformed the monastery’s appearance. Following the Russian revolution, the monastery was subject to harassment throughout the 1920s and closed in 1929. During the Soviet period, the buildings were used for various purposes, including as a village school, but vandalism and lack of maintenance took their toll. The monastery walls and part of the St.Nicholas Gate Church were dismantled for brick by local villagers. An attempt to conserve the monastery in the early 1970s had only limited effect. Under these circumstances, it is something of a miracle that the historic structures were preserved at all. A sustained revival of the Avraamy Gorodetsky Monastery began in 1990, and in 1991, the first liturgy was held. Since then, the monastery has regained its active status and attracts numerous pilgrims. Its three churches have been beautifully restored and the cloisters refurbished. Parts of the monastery cemetery, which was desecrated during the Soviet period, have also been reclaimed. One of the most interesting discoveries in the cemetery is a wooden chapel consecrated in 1997 to honor the 400thanniversary of the birth of George Learmonth, a Scottish mercenary who entered the service of Polish King Sigismund III Vasa during the Polish-Muscovite War (1609-1618). Captured by Prince Dmitry Pozharsky at the siege of the Bely Fortress in 1613, George Learmonth decided to enter Russian service, and after years of loyalty, was granted land in the Chukhloma area. Killed in battle against Polish forces in 1633, he was buried at the Avraamy Gorodetsky Monastery. George Learmonth’s most famous descendant was one of Russia’s greatest writers, Mikhail Lermontov (1814-1841). There is no evidence that the young poetic genius and author of the psychological masterpiece A Hero of Our Time (1838-1840) visited the monastery, yet its connection to his courageous Scottish forefather is now commemorated. 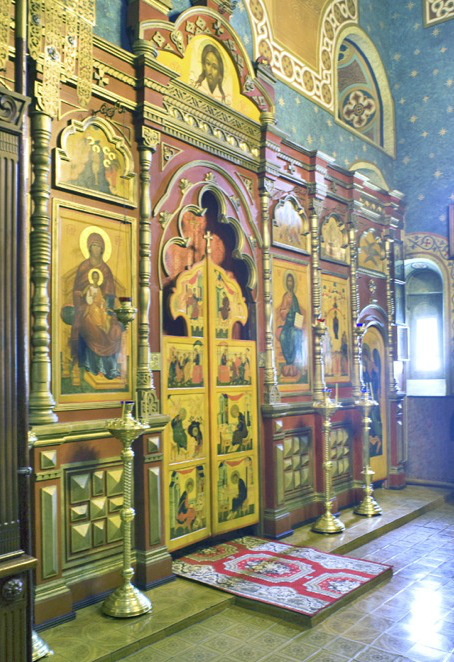 Thanks to the efforts of the “Lermontov Heritage” Association (which includes Lermontov family descendants in the United States) as well as the support of the Diocese of Kostroma and Galich, a chapel-monument to the Lermontovs now stands on the sacred territory of the Intercession-Avraamy Gorodetsky Monastery.